ALSO MAKES A GREAT CHRISTENING PRESENT! Choice of Premium Frames - Wide Flat Silver shown - See Frame Range Here. Choose from UK, Irish, or Scottish Version. 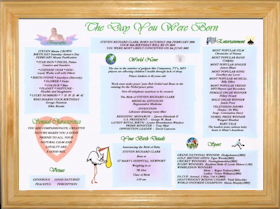 Laminated A4 Size Baby Birth Certificate. 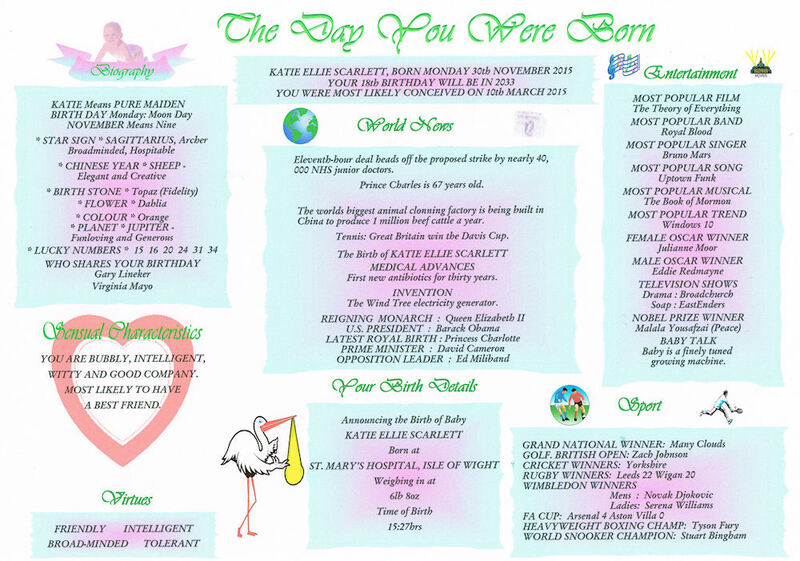 BABY DAY YOU WERE BORN charts are personalised with baby's Full Name, Birth Date, Place, Weight, and Time at Birth. 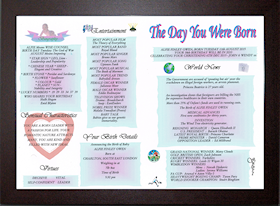 Together with a host of related information, provides a unique keepsake that will be treasured by you, family, & friends for many years. 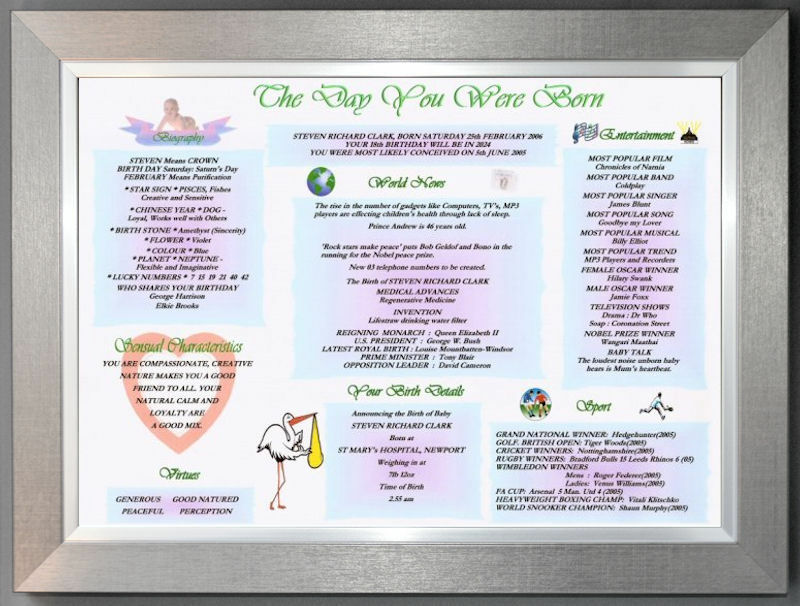 A lovely christening present or great gift idea for parents following a recent birth. 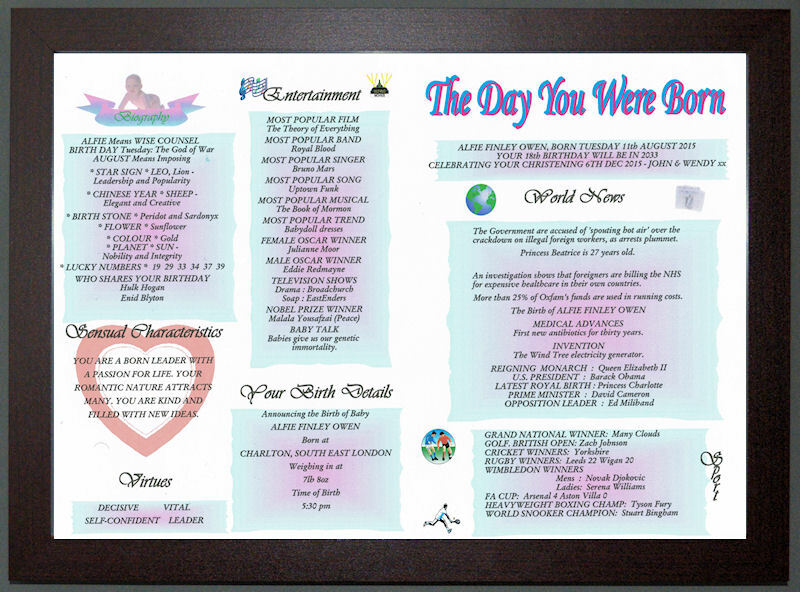 These certificates provide a wealth of information, including actual news events, personal characteristics, entertainments, and sports snippets. Please note as product is based on real news, there may be a delay of up to two weeks for a very recent birth event. 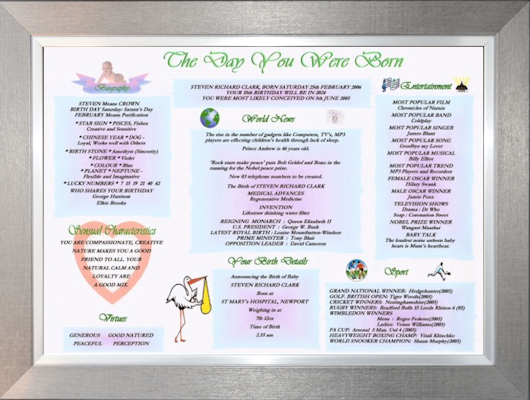 Framed Baby charts are A4 size and presented in three versions:- UK, Irish, or Scottish. 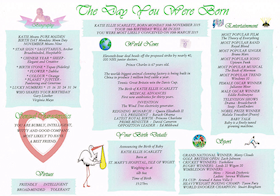 For full details see List Baby Gift Information. 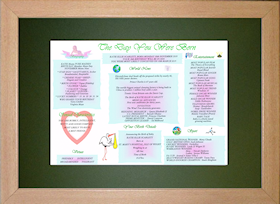 A larger A3 framed version with bevel mount is offered for that special gift. Choices are available for each of the products below when you select the 'BUY' button. Choose from UK, Irish or Scottish Version. 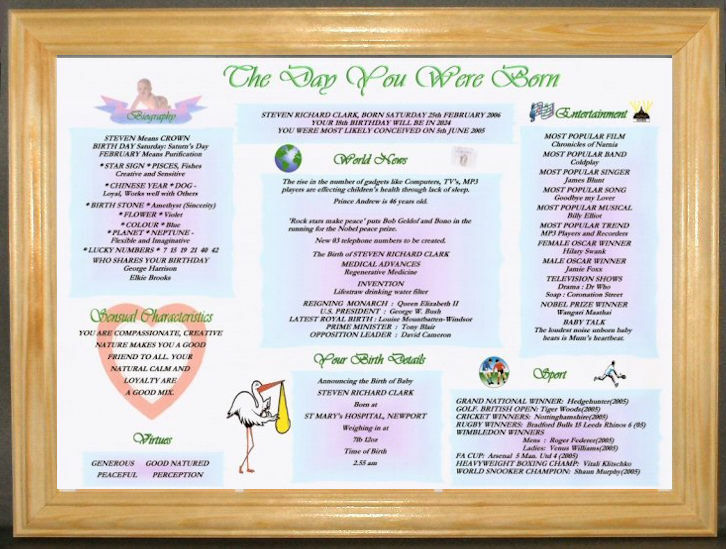 At a bargain price, this economy framed baby chart version still provides the same birth news and events details, including option for your own greeting. Dark Rosewood Style shown. For cost conscious overseas customers, this product gives cheapest option for AIRMAIL delivery. 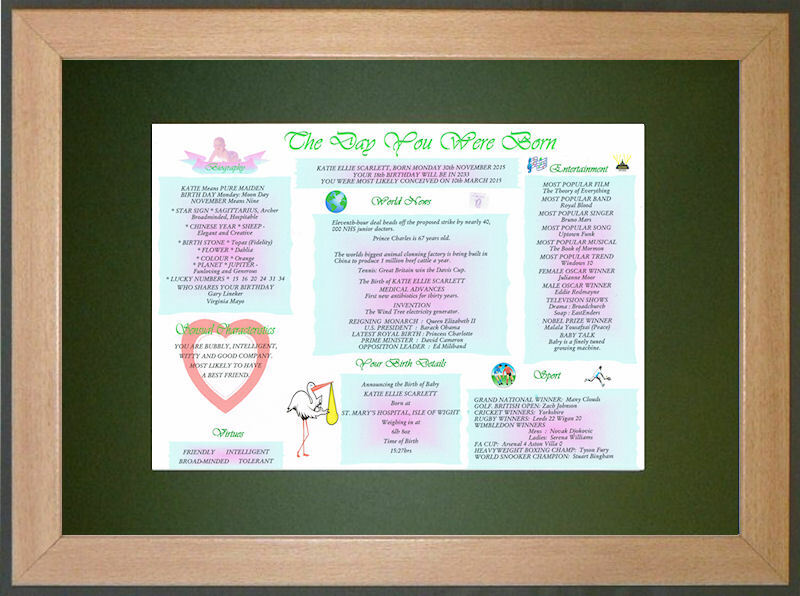 For a more elaborate quality gift idea for that special birth, choose this large A3 frame with bevel mount version. 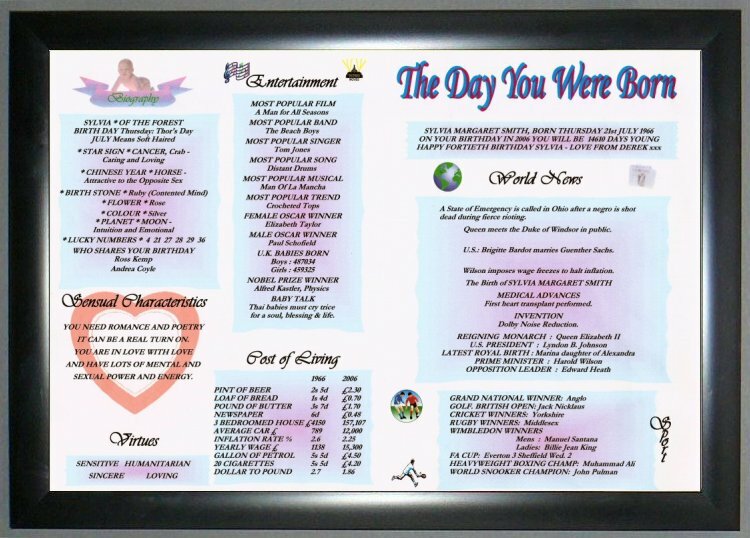 Available in choice of frame styles similar to standard A4 frame , but in a large 18x13 inch approx. 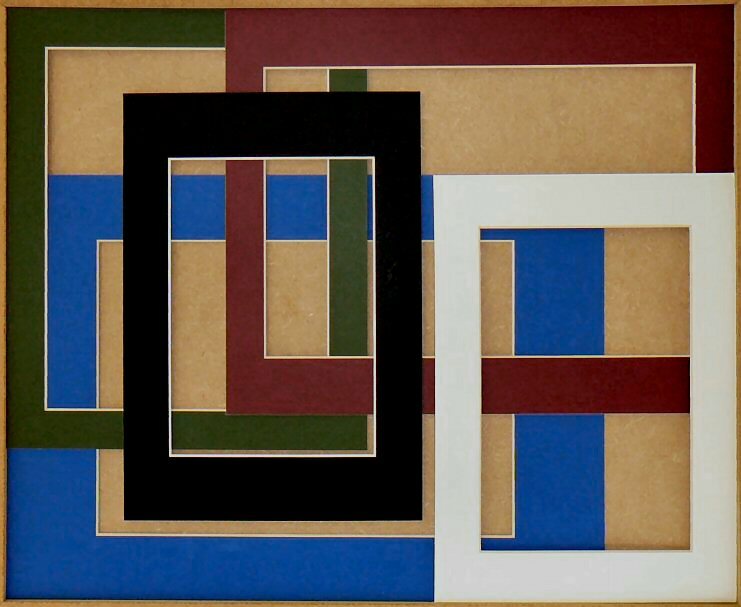 A3 frame & choice of mount colours.